Capturing the live praise and worship heard at Planetshakers' conference held this past April in its home-city of Melbourne, Australia and at gatherings attended by tens of thousands in Manila (Capital of the Philippines) and Kuala Lumpur (Capital of Malaysia), Planetshakers Band have released its Legacy CD / DVD . 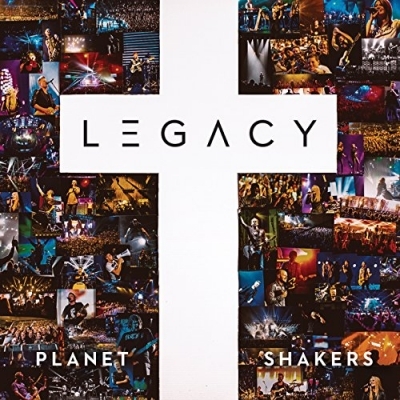 Legacy follows a long line of critically acclaimed recordings from Planetshakers Band, including two 2016 releases that received GMA Dove Award nominations this year. Read More Capturing the live praise and worship heard at Planetshakers' conference held this past April in its home-city of Melbourne, Australia and at gatherings attended by tens of thousands in Manila (Capital of the Philippines) and Kuala Lumpur (Capital of Malaysia), Planetshakers Band have released its Legacy CD / DVD . You always get energy with Planetshakers. You can guarantee that. You only have to put the CD on and hear the songs 'Alive & Alive', 'Prophecy' and 'Through It All', which are all big dance/pop praise songs. Crowd going crazy, drums with big beats, catchy and hooky choruses is what this album is all about. This is like worship music that's had more than a few energy drinks. Even if you are not in the mood for high energy worship music, still put this on, this album and its tracks are infectious. 'We Speak Life' is the first time the album moves into the more softer side. Yet the passion doesn't go anywhere. It really doesn't. Strangely enough if anything this track feels as anthemic as the up tempo numbers on this album. The music seems to head into more of an intimate time of worship in the middle part of the album. Tracks like 'Here's My Life' are on the verge of being power ballads. Good power ballads at that. The album also continues with a few more intimate worship songs like 'All On The Alter', let's be honest, it started off on the more reflective side. The song soon builds and builds into that big 'no matter what' outpouring of praise sound that bands like Planestshakers love. You can't get comfortable with this album, because we are soon back into the big tempo songs with the brilliant 'Passion' being the highlight of the album. I could listen to that track all day. What I enjoyed most about this album is no matter the beat or tempo, the album oozes energy and passion. Vocally everyone sings perfectly, and it's a phrases I like to use 'like nothing else matters', everything is given in the lead singer's voice. Musically it's all about the modern sounds that are so popular these days, you only have to hear the track 'Drawing Closer' to know Planetshakers want to sound like artists that are in the charts or making splashes on You Tube. Planetshakers have always wanted to be relevant, musically, to young people - and they make a great job of it on this record.